I am in a bit of denial that summer might possibly be drawing to an end. I’ve been busy with a big project (and a few smaller ones and a handful of food-related trips) all summer and that, combined with the horrible weather we’ve had most of the season, makes me feel like summer never really started. Luckily, there is still some good, local, summery produce to be had. 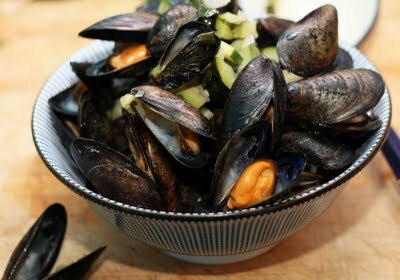 In this case, I used zucchini to give a light, fresh flavor to the deeply savory mussels. I ended up eating the leftover stock and vegetables with a spoon like soup after we finished all of the mussels, it was that good!